Recently, the kind folks at GROHE sent me a shower head for review. It isn’t an ordinary shower head to begin with, but something unique and fun that I’ve never seen before. When I reached home that day, Little Edison excitedly ran to me and said, “Mama, somebody sent you a very pretty flower pot!” I was like, “Could it be Papa?” I knew it wasn’t him because he isn’t the kind of guy who will buy flowers for his wifey. Anyway, I checked the package and found that it was from GROHE. So this must be their new Rainshower Flower Collection that they e-mailed me recently, I thought. I stood there for a while to admire the beauty of this new shower head, which looks more like a pretty flower pot. Inspired by tulips, sunflowers and orchids, the colourful Rainshower Flower Collection is the latest product from GROHE. I’m sure all of you know GROHE. It’s the world’s leading provider of sanitary fittings, and a global grand for sanitary products and systems. Just as I told Edison that the flower pot is actually a shower head, he was completely puzzled at how he can shower with that ‘flower’. I changed our current shower head to the Rainshower Flower, and I’m so delighted to see how it brings a fresh look and inject fun into my bathroom. He’s certainly more excited than me because shower time means more FUN to him now. The flower-lookalike shower head dispenses water like soft raindrops, that’s why it’s called Rainshower. The petal-shaped bumper surrounding the shower head is easily removable. The Rainshower also share the GROHE StarLight chrome finish, which means that they will retain their sheen for many years. Rainshower Flower Collection is available in six attractive floral colour schemes at a retail price of SGD177 at all authorized GROHE outlets. They inject colours and fun into your bathroom, and they make a perfect gift for all occasions too. 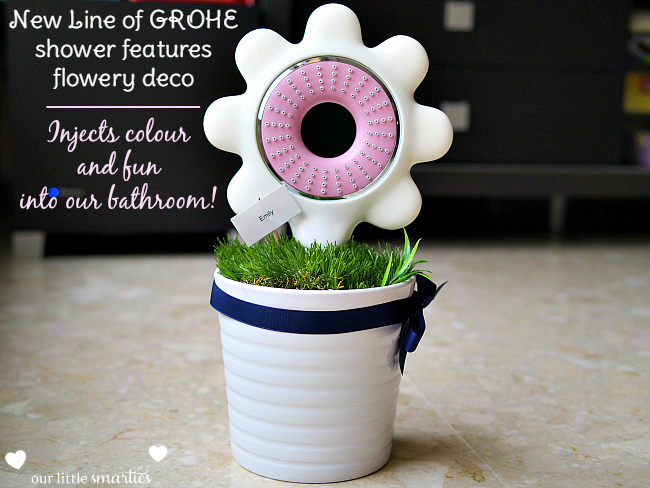 Disclosure: Rainshower Flower Collection is provided by GROHE for review. No monetary compensation was received, and all opinions are my own.